I love talking about Elizabeth Warren. She is the quintessential politician. Lying, scheming and all with a sad pouty face whenever someone calls her on her crap. I spend an inordinate amount of time looking at memes of her and all the fauxcahontastry it entails. I’m so glad the President threw her under the bus. She is caught up in an Obama administration scandal. Wait, what? This was the guy who reassured us his presidency was scandal free, un-ironically and with a straight face? Why wouldn’t you believe an Obama sycophant? They are usually pretty trustworthy. Okay, I give him a pass. Wait, what? The Consumer Financial Protection Bureau (CFPB) was created with no congressional oversight? That should be shocking news, but no one seems to care about fancy bureaus with acronyms. Oh, Elizabeth Warren created it? This should be juicy. The CFPB gets its funding directly from the Federal Reserve, which means no one will ever know what is going on there. So, you’re telling me a government bureaucracy’s name is actually not reflecting what the bureau does? I am shocked I tell you. I trusted these guys. Congress cannot defund the agency no matter what they do. Well, if you live by executive power, you die by executive power. President Trump has named Mick Mulvaney as director of the CFPB and Democrats lost their mind. They even sued to stop it happening. Did anyone sue Obama when he tried to appoint the worst people imaginable to executive branch positions? I have no idea. I bet someone did, so that argument probably doesn’t hold up. But seriously, who doesn’t love petty politics? It’s my favorite dinnertime conversation topic and favorite bedtime pillow talk topic with my wife. Good thing a federal judge threw out the lawsuit. Hopefully Mulvaney can really stick it to this bureau. Better yet, why doesn’t he just recommend that Congress gets rid of it? The Conservative Treehouse gives some good information about the agency and the appointment of it’s director. “The CFPB was essentially created to work as a legal money laundering operation for progressive causes by fining financial institutions for conduct the CFPB finds in violation of their unilateral and arbitrary rules and regulations. The CFPB then uses the proceeds from the fines to fund progressive organizations and causes. That’s the underlying reason why the Democrats are fraught with anxiety right now. 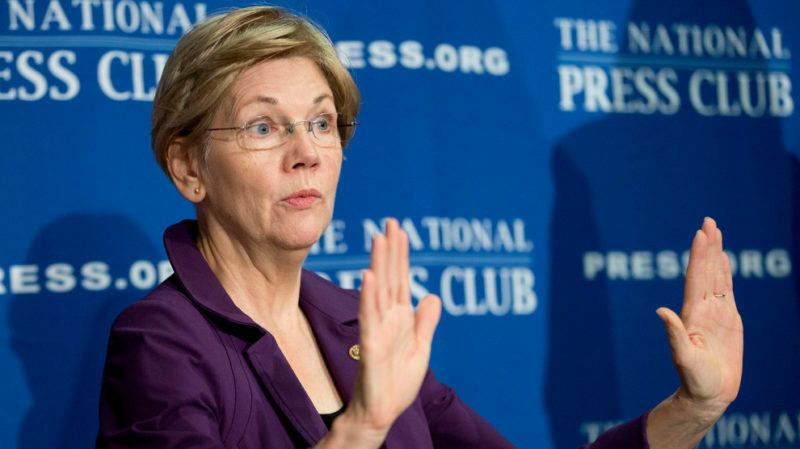 “Elizabeth Warren set up the bureau to operate above any oversight. Additionally, the bureau was placed under spending authority of the federal reserve. The CFPB gets its operating budget from the Federal Reserve, not from congress. Again, this was set-up to keep congress from defunding the agency as a way to remove it. Everything about the way the CFPB was structured was done to avoid any oversight. Hence, a DC circuit court finding the agency held too much power, and deemed the Directors unchecked position unconstitutional. “Mick Mulvaney is now in a position to look at the books, look at the prior records within the bureau, and expose the political agenda within it to the larger public. That is sending the progressives bananas. “Most likely President Trump will not appoint a replacement until Mulvaney has exposed the corruption within the bureau. That sunlight is toxic to Elizabeth Warren and can potentially be politically destructive to the Democrats. If the secrets within the bureau are revealed, there’s a much greater likelihood the bureau will be dissolved. The White House had something to say about the Democrats. “It’s time for the Democrats to stop enabling this brazen political stunt by a rogue employee and allow Acting Director Mulvaney to continue the Bureau’s smooth transition into an agency that truly serves to help consumers,” White House spokesman Raj Shah said in a statement. Hopefully, we can see some real change in Washington. I’m tired of all the rules and regulations. Just leave us alone and we will take care of ourselves. Stop stealing our money and spending it on votes domestically and murder overseas. We don’t need you anymore. Better yet, let’s throw you all in jail.